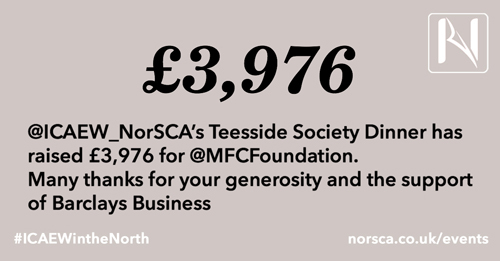 Northern Society’s Teesside Annual Dinner on Friday 24 November 2017 at Wynyard Hall raised £3,976 for MFC Foundation. 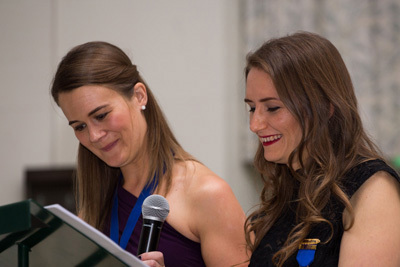 Emma Read and Angela Foster, Co-Chairs of the Teesside Society of Chartered Accountants (TSCA) were delighted to announce that members attending the dinner together with their guests had generosly supported the fund raising in support of MFC Foundation. Funds raised on the night were matched by Barclays Business which meant that the grand total of £3,976 was raised. Many thanks to everyone who contributed. Set up by Steve Gibson in 1996, MFC Foundation is the independent charitable arm of Middlesbrough FC. Though it uses the official ‘Boro’ brand to engage with various members of the community, MFC Foundation exists as a separate entity from the football club. The Annual Dinner was held at Wynyard Hall with principal guest speakers Lembit Opik the former MP for Montgomeryshire in Wales until 2010. 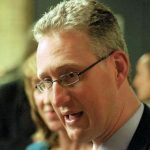 In August 2016 Lembit performed in the comedy Rocking Your Vote in which he played himself. The play was on the Edinburgh Fringe Festival. and Paul Aplin, Deputy President ICAEW.